I use iClickers in my Politics class down at BYU, and it they are pretty nice. Last week I learned about SmartTechnology’s Senteo system which is pretty neat. The video below will give you a taste of it. The nice thing about it that there are so many possibilities with it. Here is a video of the action with my students participating. 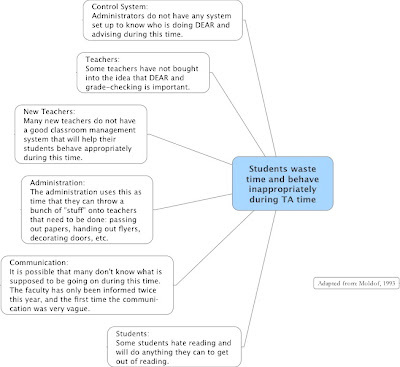 So, here is the neat thing: at our school, we are supposed to give assessments and analyze the data. They want us to do really in-depth data analysis. This spreadsheet shows what Senteo exports. This is great because if you make these lists (which I am not sure how to do) you can show only those who missed certain questions, or those who got certain questions right. It is really neat. With these spreadsheets, you can see how well you teach certain topics, see how you need to improve, see if a question is throwing everybody off. You can also find students that are doing really poorly, and figure out how to differentiate instruction for them. Update: Thanks to Kyle who commented below and solved the major issue that I have with this program, kind of. He suggested using shift while dragging. That makes it a floating topic, and disconnects the subtopic from its parent. Also, the “quick start” guide is 30 pages long! 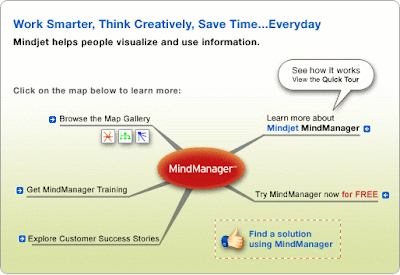 As you can see from the picture to the left, MindManager 7 is a product that helps people visualize information. This is a great idea because many people, especially children can understand things better if they visualize them. This program can help facilitate children’s learning. Mindjet pitches this to businesses, education, NPOs, government agencies, and individuals. Academic pricing is $149. Once you make a mind map you can export it in a number of different formats: PNG, JPG, TIFF, RTF, PDF, web page, and some others that I didn’t even know existed. The best export is the PDF because it adds some white space around the map, and that makes it look nice. The picture formats (TIFF, PNG, and JPG) were good exports also, but they cut off the top-most and bottom-most lines on the subtopics. as shown below. It doesn’t look like it cuts the borders off too much, but it is enough to be annoying. Another good feature is that there are plenty of things you can add to spice up your map. It doesn’t have to be boring like the one on the left. You can add all kinds of graphics, pictures, arrows, and pretty much whatever else you can think of. You can also link other files to your map, including Outlook contacts, Word files, spreadsheets, websites, and more. You can also draw relationships between different subtopics, which is very useful as well. Another good feature of this program is the ability to collapse and expand subtopics. Collapsing subtopics helps the productivity maniac focus on just one idea, not the whole enchilada. I did not like this program. I have a real issue with programs that make me fight them. The video clip below explains one feature that really bugged me. MindManager makes you put parts of your map in certain places. For instance, if I want to place a new subtopic somewhere the program would suggest a spot. Most of the time, that is great…but sometimes, I want a bubble where I want it. I wanted the figure I was making to look nice, but the program would not let me put things where I wanted them. I am a firm believer that the software needs to get out of the way so that I can do what I need to (like Jing). This program just got in my way. I tried to figure out how to change that setting, but I couldn’t find it. The preferences menu is one page with only six options. If I wanted to move just one subtopic somewhere, then it would affect all the other subtopics and that drove me nuts. My finished product still does not look how I want it to, but it does look good enough, I guess. Basically, I had to stop using this program because it was way to difficult to get it to do what I wanted. It took more time to figure out how to make it do what it should than it did to make a more complex map in Inspiration, which I will review next.